Illinois DeLorme Atlas: Road Maps, Topography and More! 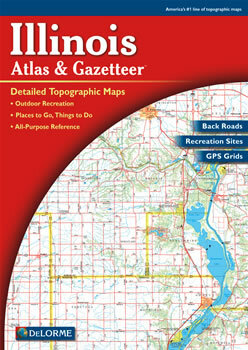 Discover Illinois in 81 pages of large up-to-date maps in the DeLorme Atlas and Gazetteer! But with 15 additional pages of reference information on the state's recreation and points of interest, this is no ordinary map! This reference information includes: fishing, hunting, canoe trips, parks, forests, recreation areas, trails, campgrounds, wildlife, unique natural features, historic sites, museums, gardens and scenic drives. This handy atlas has an index of Illinois place names for easy look-up. The back cover of this atlas has a large map of Illinois with an overlying grid. Each cell of the grid contains the page number for a detailed map of that area. The detailed maps show physical and man-made features, which include: lakes, islands, rivers, creeks, springs, reservoirs, dams, towns, cities, roads, highways, interstates, county boundaries, parks, preserves, forests, airports and railroads. The details and extras can help to plan your next vacation in Illinois!